Livable, beautiful, comfortable! 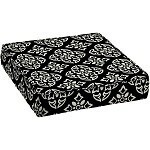 Add style and comfort to your outdoor living area with this Better Homes and Gardens Outdoor Deep Seat cushion. This cushion fits most standard patio deep seat chairs. Filled with everLUXE polyester, the latest in fiber technology, it is designed to provide long-lasting comfort while you enjoy your outdoor space. It features a durable outdoor fabric that repels water and has been UV treated to resist fading. Easy-care polyester fabric can be cleaned using just soap and water. This cushion can be used alone or coordinated with other items in the same fabric collection, allowing you to add a pop of color and personal style to your outdoor space. This attractive Better Homes and Gardens deep seat cushion will make a great addition to your outdoor furniture set, with style and comfort that will last!